Love to create repeating blocks in your quilts but tired of the same patterns? Step away from the ordinary and try your hand at a new technique-based approach to improvisation. Gorgeous photographs illustrate 10 beautiful projects unique approach to creating one-of-a-kind blocks with guided exercises that explore scale, symmetry and alternate gridwork. Then, with Amy's help, you'll have the opportunity to design your own patterns. You really can have a dash of the unexpected through improv with the precision of paper piecing and still create those secondary patterns we all love in quilts made using traditional blocks. 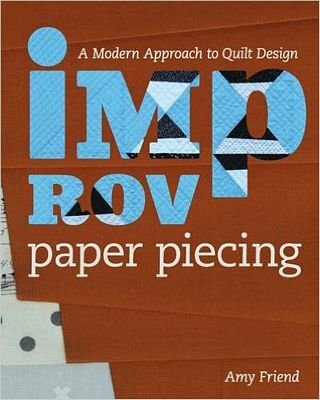 With a modern spin, Improv Paper Piecing gracefully guides the reader, step-by-step, through improvisationally designing your own paper piecing patterns to strategically setting the grid -- so that the end result is a masterful, unique quilt of repeated blocks. If you're looking for a fun and exciting challenge, the part is here. Step over and stitch outside the box. 144 pages, Paperback, by Amy Friend; Author of the Blog 'During Quiet Time,' Published by Lucky Spool Media (Taunton Press).